This high quality portable tripod is the best piece of equipment for aspiring and professional photographers alike. Featuring a precise and stable ball head; you can capture the perfect photo or video at virtually any angle, thanks to its full range of fluid motion and accurate spirit level reading. 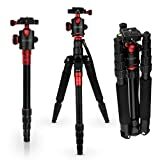 With its quick release, extendable, telescopic legs; this adjustable tripod is easy to assemble and carry thanks to its light and compact design. Made from a sturdy aluminium alloy, this professional tripod is compatible with almost all digital cameras, DSLRs, SLRs, MILCs and camcorders. For smartphone use, simply attach a head adaptor (not supplied). Max Load Weight: 6kg ¦ Max Height: 61″ / 1550mm ¦ Min Height: 21″ / 530mm. Tripod carry case is included. • The rubber feet help to secure the tripod into position whilst preventing scratches to floors and surfaces. • Foam handles allow for a sturdy grip. The carry strap also allows you to fasten onto snap hooks and clasps, ensuring easy transportability especially when travelling. • A weight-bearing hook on the centre column allows you to add weight for increased stability. • Comes with a drawstring pouch for convenient storage. This compact and lightweight tripod makes this the ideal travel accessory and a must-have for any photography toolkit whether you’re a professional or amateur photographer. This entry was posted in Discount Photography and tagged Alloy, Ball, Black, Camcorder, Camera, Cameras, Caseflex, Digital, DSLR, Head, Mount, Premium, Professional, Stand, Tripod, Video by Ball Photo. Bookmark the permalink.